The ultimate companion to users of Oracle® Transportation Management. Installs on your desktop or laptop in only a few moments and can work with the tools you already use every day such as Excel®, SQL Developer, or XMLSpy®. Quickly download Transmission XML in batches, upload Transmissions for testing or support, troubleshoot your Agents and workflow, convert columns into an OTM friendly list with one click, and much more! Much of life is repetitive. But some things do not have to be. We took those areas of OTM and simplified them. From cost savings at the project level to the daily business process, OTM Jargon simplifies the specialized and saves you time and money. Real users (former and current) and consultants of OTM have contributed to the design and features in OTM Jargon. 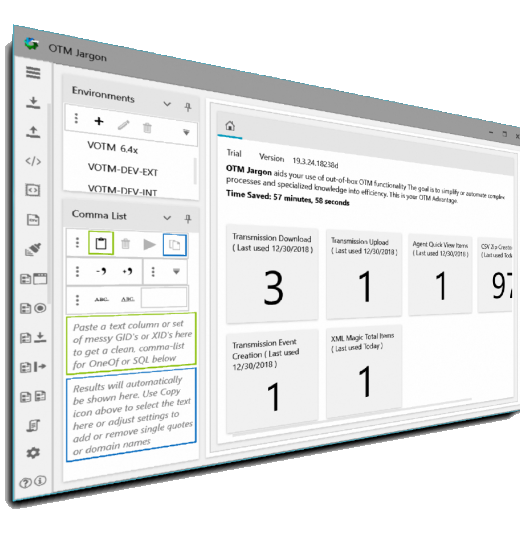 Targeted for Subject Matter Experts (SME)s in OTM with some technical understanding, the first release of OTM Jargon decouples some of the overly technical challenges and converts them to a few easy clicks. Do you want to pay your consultants to copy columns of orders into Excel multiple times per day? Or perhaps to click around for hours downloading transmissions? It is expensive work and you probably are doing it and don't even realize it. OTM Jargon could save you thousands of dollars per resource per week and free up more time for the real work. If you are like us, it bothers you to bill for repetitive tasks such as moving orders from environment to environment or clicking and digging through dozens of copies of agents. OTM Jargon is designed to help you spend more time on doing the real value-add activities and less on the required-but-repetitive. Supporting an OTM implementation takes a unique combination of technical and functional skills to quickly recognize and resolve problems for the business. OTM Jargon can reduce the time it takes to get the business back up and running or to perform root cause analysis (RCA). Many tools on the market today were built for one customer and simply packaged to resell. That strategy creates gaps because every customer is different. We built this software from the input and combined experience of 15+ years as OTM users and consultants. This tool helps save time because we have done the manual processes for a long time and focused on the best value areas. And new features are being added. Something on your mind? Suggest one! The OTM UI does not allow One Of searches for Transmission or Transaction numbers. OTM Jargon allows you to search for one or multiple Object GIDs or Transmission or Transaction Numbers with one click. Open multiple tabs and then move them around, side-by-side, or any way you see fit to easily manage your work. PRO Feature: connect to cloud hosted instances over secure SSH. No need to type the same URL over and over. OTM Jargon remembers how you work and what instances you use to save you time. Most people that work with Oracle database use the free SQL Developer software or at least have it installed if they use other tools too. OTM Jargon can work with your existing SQL Developer connections so you are up and running fast. OTM Jargon only uses out-of-box supported interactions with OTM. So no crazy direct SQL updates here--only faster ways to access the standard actions. Your data is not transmitted anywhere you don't tell it to go. Most Windows® computers have .NET already installed or sometimes it is available in the Windows Updates section. Do I Need Oracle SQL Developer Installed to Use OTM Jargon? No, it is only recommended for specific features which require database access because it is a good tool and because OTM Jargon can import your current connection list from it. Most users will already have SQL Developer installed, so if you do not have it installed, then you probably do not require it. Do I Need to Install Anything First? It is unlikely. Just download using the links on this site and run the exe. Most Windows computers include Microsoft .NET already. Once you download and run the OTM Jargon Setup, the bootstrap installer will check this for you and tell you automatically if it cannot find a necessary component. For users running Windows 7: If the installer prompts you to download and install Microsoft .NET but you do not have administrative rights on your computer, simply go to Windows Update and check for Optional Updates. The most recent version of Microsoft .NET should be listed. Installing the update from Windows Update typically does not require administrator access. This software is designed to save you time and money. No database changes are made from the software, it only queries and automates supported data entry options such as integration or CSV uploads. We perform unit tests, quality assurance tests, and even use the tools ourselves. However, it is always smart to try things on a non-production server prior to using them in a production environment. Database features are clearly marked as such and they require you to have valid database credentials to use. Integration features require a valid OTM username and password to use them as well. These credentials are not transmitted to us at anytime. They are used in the same way you already use them--through SQL Developer to connect to the database or into the OTM website login using the same basic URL you already use. It is always best to use SSL connections. Includes as many features as possible for a 45 day trial of the software. Includes the key features of Transmission Download, Transmission Upload, CSV Util helpers, and Column Jargon (for lists). The essentials for SMEs, support personnel, or consultants. Includes more features specifically targeting heavy, techno-functional use such as for dedicated OTM Professionals or Consultants. By downloading or using the software in any way, you agree to be bound by the terms of the license agreement. Please review it carefully. Can I share my license with others? No. Each user must have their own license. But we do believe in multiple devices per user, just not at the same time--see below. Can I use my license on my desktop and laptop? YES. We really do not like companies that charge per device for no reason other than to bump up the cost. Unless we find a new reason not to (other than to prevent abuse), each license allows the user to install on up to three devices before questions begin to arise. If you have a valid reason to install it more, just let us know. We have quite reasonable folks in our company. Do I get a price break if I buy multiple licenses? No, but possibly. We are quite reasonably priced already, when you consider the ROI. Contact us if you would otherwise like to present a case. We do not collect your personal or business data unless you give it to us for some reason such as support. Even if you do give it to us we will protect it to the best of our ability. Some non-personal information such as statistics and how the program is used are collected. We don't sell or share any of your information with anyone other than to fulfill our services to you and/or to develop the best software out there. Check out our forum channel to pose your questions so that others may also benefit from the answers. Also enhancement and feature requests are handled through the forum at this time. We will do our best to respond in a reasonable timeframe to email support requests, but the forum should be considered first. Contact us if you would like to discuss special, paid support service options. Most users are habitually doing things the hard way because there was no other option. Now there is. So use the Free version for a bit to break the habit and see your time savings add up. Then come back and upgrade so we can offer even more. Quicker satisfaction than term life insurance at roughly a $1 per day, the Power User license addresses the most common daily tasks for basic support and build/agent work. Think grabbing transmissions from Production or Stage and running them through development in a matter of minutes or ensuring all of the dependencies of your shiney new Agent are listed in your migration project with two clicks. Professionals need it all and you will have it. Designed for the full-time OTM consultant, technical/functional, or support role, this version emphasizes users in the daily grind. At roughly $1 per typical work-hour per year, the ROI on this will be in the black before you finish your first project. Payment processing is handled by PayPal. Clicking "Buy Now" will take you to their secure site before returning here to complete the transaction. A PayPal account is not required to purchase. Enter a primary License Email address here; or we default to use the billing one. Contact support to change or assign multiple licensee email addresses. Number of licenses / quantity can be entered on the next screen. Enter a primary Licensee Email address here; or we default to use the billing one. or contact us using the form for Questions, Estimates, or Purchase Orders. Site Design and Related Elements by: Avalletta LLC and Impact Media Live Inc. Copyright © 2016-2019 Avalletta LLC. All rights reserved. Avalletta, OTM Jargon, Column Jargon, The OTM Advantage, and OTM Guru are trademarks or service marks of Avalletta LLC. Oracle and Java are registered trademarks of Oracle and/or its affiliates. Microsoft, Windows, Excel, and SQL Server are registered trademarks of Microsoft Corporation and/or its affiliates. XMLSpy is a registered trademark of Altova and/or its affiliates. Other names may be trademarks of their respective owners. Avalletta, its products and services, including this website, are not endorsed nor sponsored by, nor affiliated with Altova nor Microsoft nor Oracle.